Everybody wants a life of freedom and to have the time to be able to do the things they want in life, no matter what it is – here’s how to get a business going that will give you that freedom. Joe: I’ve been sending you a lot of videos lately. 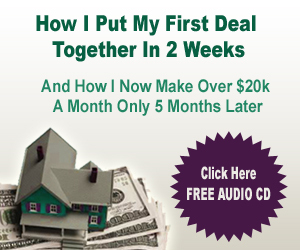 Hopefully, it’s gotten you excited about the process of what’s possible in real estate investing and has given you a lot of great ideas on things that you can do to build your own business whether you work with me or not. 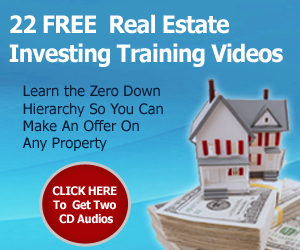 Joe: It’s been my goal and philosophy to give away more free information than most real estate teachers sell. I want you to be able to do this work. I know it’s not possible for everybody to get involved. I know it’s an expensive program. I know I’m putting some restrictions on it simply because of the cost. I have to make it a sustainable business for me and that’s why I charge for this. I’m not doing it for charity; I’m doing it because I want to make more money. 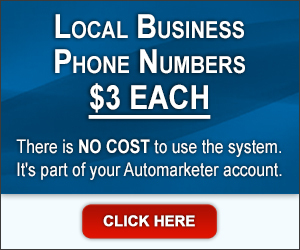 I’m doing it because I want to bring partners in who will work with me and who will share the profits with me. Joe: But I want to be able to teach them first, and if I just brought in people that I had to teach, it would be a lot of work to try to get to the money for them. Some of those people that come in aren’t going to do the work, but the people that do the work always make money. It’s just a matter of some people coming in and they realize that they made a mistake; they say, ‘This isn’t for me. I don’t want to do this.’ But I think it’s not that they don’t want to do it. I think it’s that their fear overcomes them, that they can’t get past that fear. Joe: There’s a story that I tell at my Buying Event and it’s about a man who’s sitting in a dark room and he’s sitting in his chair and he’s paralyzed in fear because in front of him there’s a snake perched in a chair, waiting to strike, and if he moves an inch, he knows that snake is going to strike and he’s going to be poisoned and die, so he’s terrified. But then, as he’s sitting there terrified in fear, somebody walks into the room and flips on the light, and he finds out at that moment that that snake on the chair was really just a piece of rope. His fear vanishes. His knowledge that that’s not a snake and that it’s not dangerous suddenly makes his fear disappear. Joe: My goal for everybody that comes to my Buying Event and Mentor Program is that the fear they have today will be just a memory tomorrow; it’ll be irrelevant to their lives. The fears that you’re able to deal with today and learn, get knowledge on and then have experience, build confidence and be able to walk through the process will change everything about your life and what you’re able to do, not just in real estate investing but in every aspect of your life, i.e. your relationships, in your work life, in your business life, in your friends’ lives – everybody’s going to see you differently – they’re going to see you as someone who maybe you don’t see yourself as right now. Joe: Maybe it’s time to take the next step. Maybe it’s time to do something that you’ve always dreamed of doing. 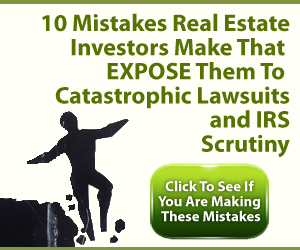 My guess is that you wouldn’t be watching this video right now if real estate investing wasn’t a dream of yours, or if you didn’t think somewhere in the back of your mind that it was possible. Joe: Only 1% of the world is entrepreneurial and has the entrepreneurial mindset, that desire to be in charge of their own life, in charge of their own business and is willing to take action to make it happen. There’s the quote: ‘There’s magic in boldness.” – By doing something and by moving forward, you actually make that thing come to life, and those are the things that my students are doing. Those are the things that I’m doing in my life. You move forward toward a goal even though you’re not sure where you’re heading with it. Joe: Every day, I test new things. All of these new ideas that I’ve been talking about in these videos have been tests that I’ve done, and for each one that I’ve presented to you in these videos, I’ve done ten others that didn’t work that we struggled through and we tried to make work and that I thought would work, and believe me, I’m pretty smart when it comes to marketing and what’s going to work. So we went through ten others that didn’t work and we got to this one thing that did work. We’ve honed it, developed it and made it work on a very high level. Joe: I put a posting on Elance to have someone do it for me, or I give it to one of my students and say, ‘Why don’t you try this?’ – or one of my students will say to me, ‘I ought to do this’ and I’ll say, ‘That doesn’t sound that great to me but go ahead and give it a try and see what happens,’ then they do it and it works! So then I’ll say, ‘If that worked, why don’t we do this and see if we can improve it or do this or do that?’ and of course I’ll steal their idea then I’ll sell it to you guys. Joe: We’ll share it with the group and we all work together to share different ideas of things that are working or aren’t working. It also gives us an idea of what works in different communities and different markets; up markets, down markets, fast moving markets, slow moving markets, etc. It gives us an idea of all of those different things, and when you become a part of that mastermind, you get all of those things with it. Joe: Anyway, I wanted to thank you for watching all of these videos. I wanted to thank you for coming on and doing this. I hope that you learned a lot. 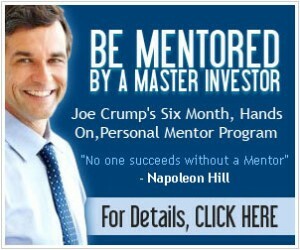 I hope that you’ll get involved with my Mentor Program. 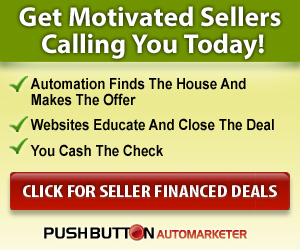 If you can’t get involved or you can’t afford that, get the “Push Button Method”. I’ve still got a payment plan on that; it makes it cheap to get into that. I’ll put the URL’s below so you can go to them if you’re interested. 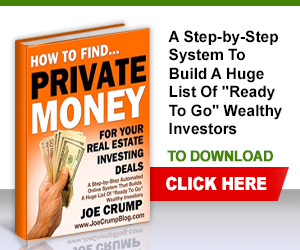 Joe: If you can’t afford it, I sell an eBook that teaches real estate investing and maybe that’ll help. If you can’t afford that, just stay on my mailing list. I give away a ton of free information like this all the time, and I’ll continue to do that and I’ll try to continue to educate you through this process. Use some of the ideas that I talked about, maybe going out there and finding some help to make that work for you. Joe: I wish you the best of all good things. I really believe that if you put your mind to this stuff and actually get to work doing it, you can have the life that you dreamed of. Joe: If you want to become a billionaire, this isn’t the stuff to do – I’m not going to make any billionaires out of this group. But if you want to be affluent, have freedom and have a lot of time on your hands you can use to do other things you want to do, or just sit around and do nothing, then you can do it by using the techniques I’m giving you. 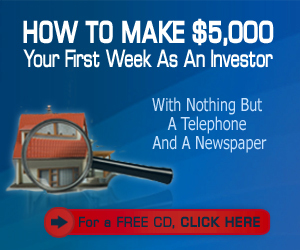 You can replace the income that you’re making now. You can double it, triple or quadruple it or do much, much more than that; there’s so much that you can do with this. Joe: My philosophy is all about quality of life. It’s not about getting rich. Getting rich is great and it does increase the quality of life but at some point, if you talk to… I’ve read books by billionaires because I’m always interested in how they got where they got to and almost all of them will say that after they made a few million dollars, their lifestyle didn’t change much at all. They’re still doing the same things, e.g. eating the same foods, going to the same places, living in the same house – they didn’t have to keep buying – they do that because that’s what they’re driven to do. 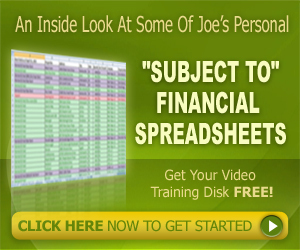 Joe: You may not be driven to make money all the time. Maybe what you’re driven to do is to have a great lifestyle, to be able to give the things that your children want or need or deserve or your spouse that you want for them, for the people that you love in your life, and you want to be able to give those things to them. Joe: I want to be able to stay at home and work out of my office here at home. That’s where I’m shooting all of this. I’m shooting this right in my office. It looks out over the back woods, where I can look at the trees out in the back. And, I love it here. Joe: My kids come home from school, and I’m here. My wife is a stay at home mom and she comes and runs the kids to the dance studio and I’m just doing my thing here and enjoying my life. When I’ve got a weekend that comes up, I don’t work most of the time. If I want to work, I work. If I don’t want to work during the week, I don’t work. Joe: So, we started designing a game and it’s looking pretty cool right now. We’ve been working on it for a year, and it’s looking pretty cool; we’re having a lot of fun with it. And, the time that I’ve been able to spend with Alex has been very, very valuable to me. I’ve been able to do that because I have all of these other things in place that make that happen and it’s given me some money that I can invest and be able to do something like that with him. 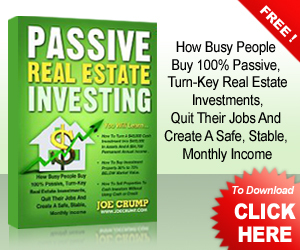 Joe: Now, if you want to become a real estate investor, the best way to do is to start investing in real estate. Learn the process. Joe: But I want to urge you – don’t do it with your own money; don’t do it with credit. If you can’t make money with no money, you sure as hell can’t make money with money. So learn the process to do it in a safe way, in a way that only takes your energy, commitment and your willingness to follow through with the things that I teach, and if you do those things you can do very, very well in this business – you can have the life that you want. Joe: I’m here and I’m proof of it and I have many, many students. You can go look at the interviews I’ve done with the students on video. The things that they’ve said on video have touched my heart and been phenomenal. It’s wonderful when you get an email saying, ‘Joe! – I just did my first deal!’ – There’s nothing else like that as a teacher. Joe: So, anyway, I hope that you can be a part of it. I hope that you’ll join us. I hope you’ll come and work with me and that I’ll get to meet you and get to know you, and that we’ll partner together and be friends. I wish you the best. Good luck and talk to you soon. Great post. It really resonated with me. It’s all about changing my life for the best. Bringing my wife home from work and gaining control over my life and finances. The hardest part is getting started.